This year's theme: "Your Story is Moving"
Add your celebrations to the dedicated CCAAA page! The World Day for Audiovisual Heritage has become a key initiative for both UNESCO and the Coordinating Council of Audiovisual Archives Associations (CCAAA) to honour audiovisual preservation professionals and institutions that help to safeguard this heritage for future generations despite the many technical, political, social, financial, and other factors that threaten its survival. 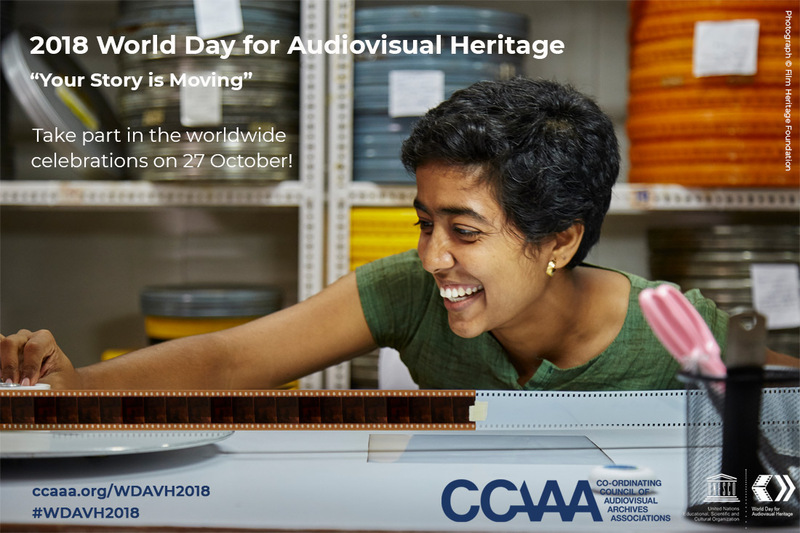 Audiovisual archives around the world join together annually on 27 October to celebrate their work with activities and events that not only highlight the vulnerability of this heritage, but also celebrate the often unheralded work of the heritage institutions that protect it. The statement is also downloadable as a PDF file in ENGLISH, FRENCH, and SPANISH. The eight associations forming the CCAAA (AMIA, ARSC, FIAF, FIAT-IFTA, FOCAL International, IASA, ICA, SEAPAVAA) strongly encourage all their members (and any other institutions) not only to join in the global celebrations of the 2018 World Day on and around 27 October, but also to share the information about their particular events, by filling the quick-and-easy form on the dedicated CCAAA page (click on « Add a new World Day for Audiovisual Heritage event» below). Your descriptive text can be in the language of your choice (or even better... in several languages), but we ask you to limit it to 500 words max. You can also attach one image per event. Please fill in and submit one form per event. Your contributions will be automatically added to the list of Word day events on this page (the latest added event will appear at the top of the list). Happy 2018 World Day for Audiovisual Heritage !